Pricing Review – SPR April 2012. 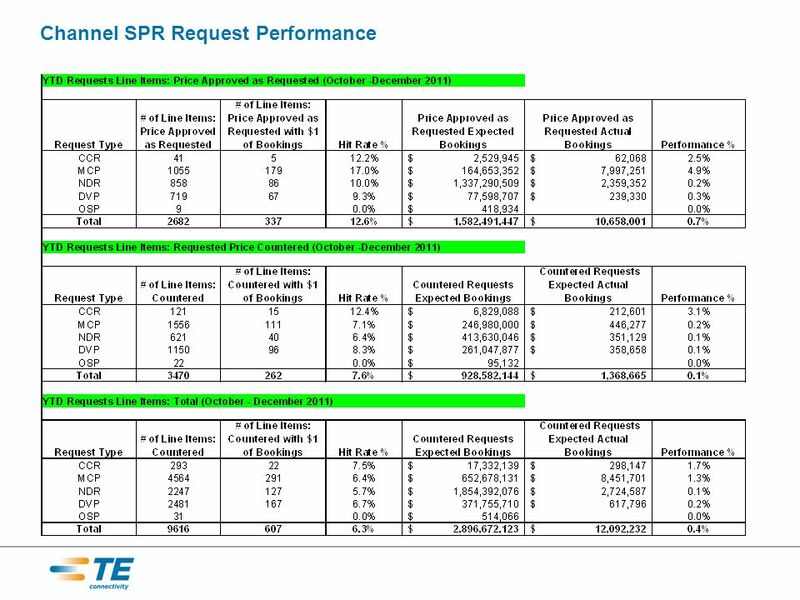 Channel SPR Request Performance. 3 BOOK PRICE? COMPETITIVE? Many of the sales today are not willing to try the book price because they lack faith in the pricing. We also tend to feed this view by; –Giving special pricing on requests with small qty or where no competitive information was provided. 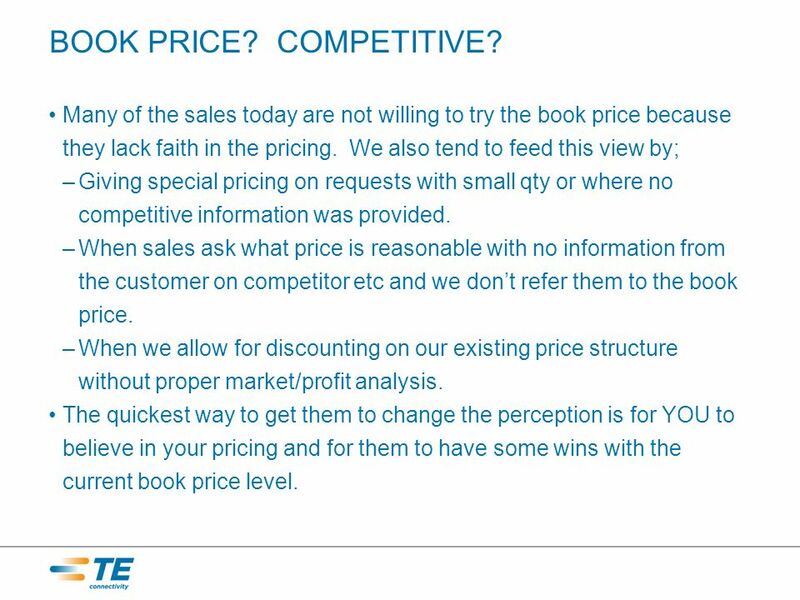 –When sales ask what price is reasonable with no information from the customer on competitor etc and we dont refer them to the book price. –When we allow for discounting on our existing price structure without proper market/profit analysis. The quickest way to get them to change the perception is for YOU to believe in your pricing and for them to have some wins with the current book price level. 4 BOOK PRICE? COMPETITIVE? 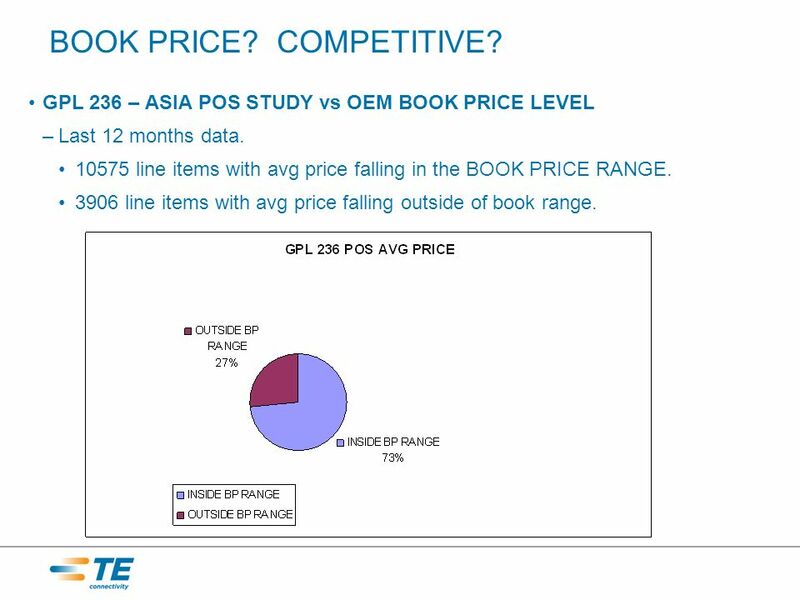 GPL 236 – ASIA POS STUDY vs OEM BOOK PRICE LEVEL –Last 12 months data. 10575 line items with avg price falling in the BOOK PRICE RANGE. 3906 line items with avg price falling outside of book range. 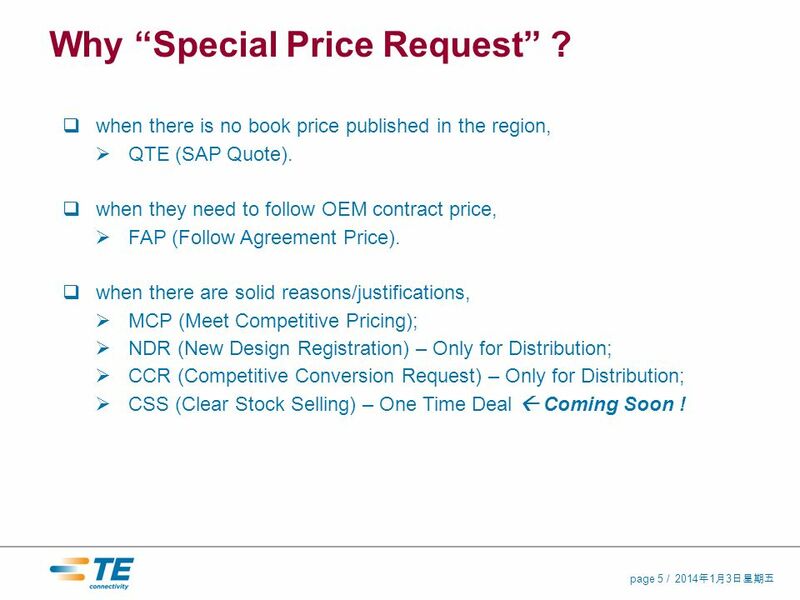 5 201413 201413 201413 page 5 / Why Special Price Request ? when there is no book price published in the region, QTE (SAP Quote). 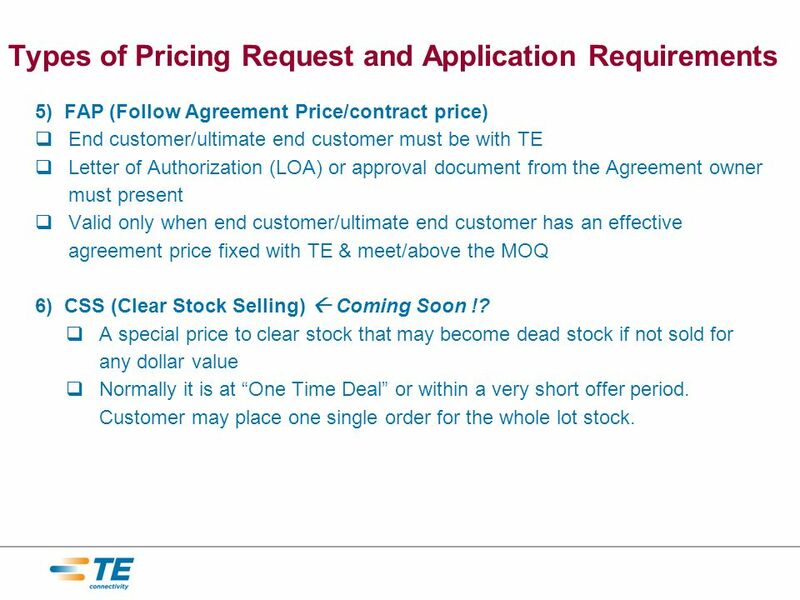 when they need to follow OEM contract price, FAP (Follow Agreement Price). 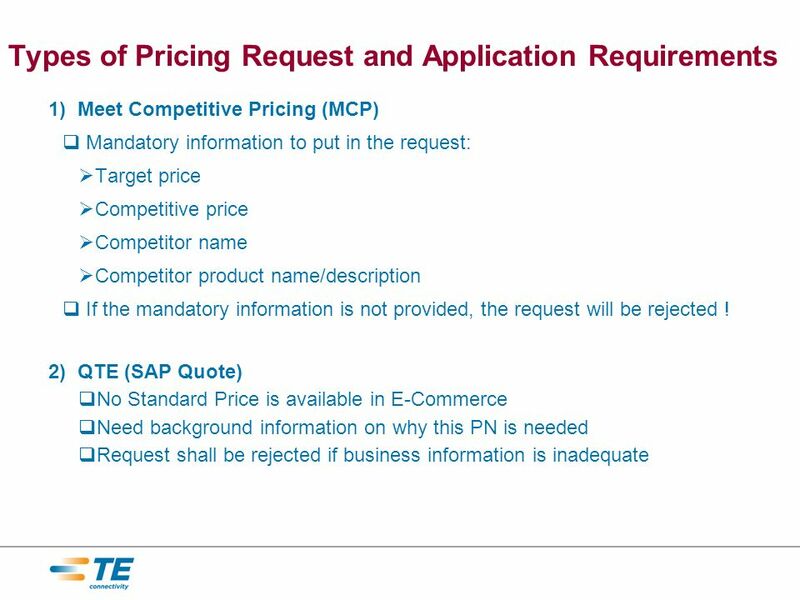 when there are solid reasons/justifications, MCP (Meet Competitive Pricing); NDR (New Design Registration) – Only for Distribution; CCR (Competitive Conversion Request) – Only for Distribution; CSS (Clear Stock Selling) – One Time Deal Coming Soon ! 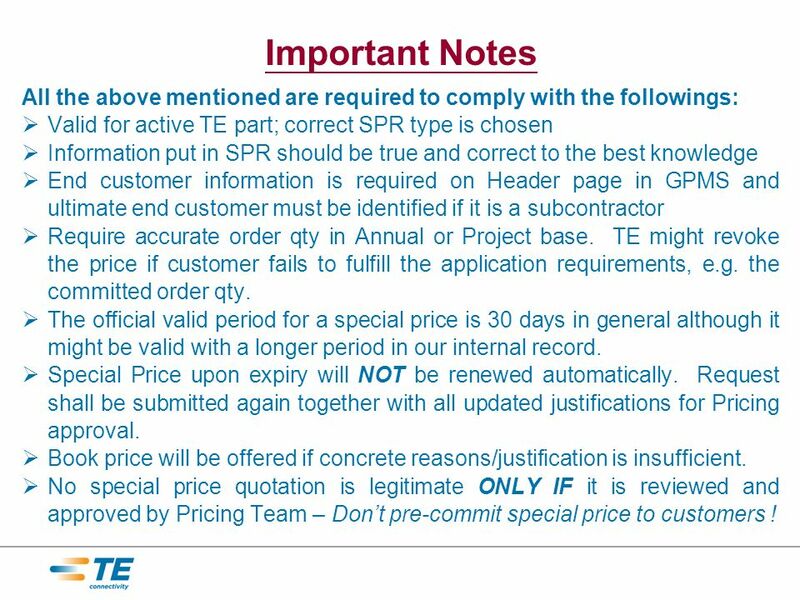 10 Important Notes All the above mentioned are required to comply with the followings: Valid for active TE part; correct SPR type is chosen Information put in SPR should be true and correct to the best knowledge End customer information is required on Header page in GPMS and ultimate end customer must be identified if it is a subcontractor Require accurate order qty in Annual or Project base. 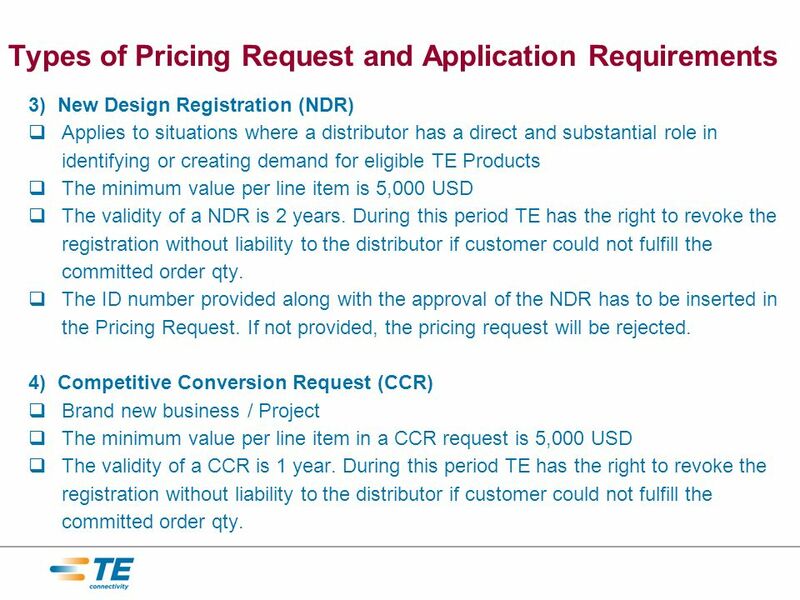 TE might revoke the price if customer fails to fulfill the application requirements, e.g. the committed order qty. The official valid period for a special price is 30 days in general although it might be valid with a longer period in our internal record. Special Price upon expiry will NOT be renewed automatically. Request shall be submitted again together with all updated justifications for Pricing approval. Book price will be offered if concrete reasons/justification is insufficient. No special price quotation is legitimate ONLY IF it is reviewed and approved by Pricing Team – Dont pre-commit special price to customers ! 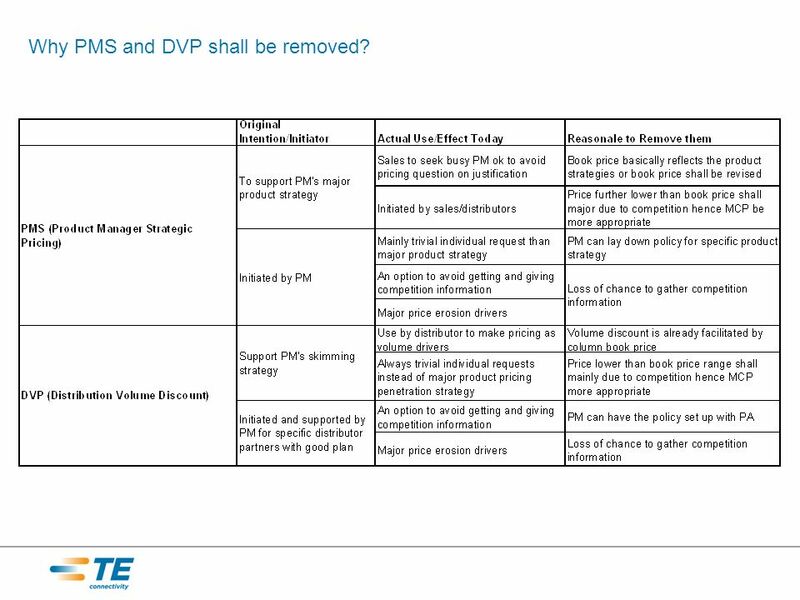 12 Why PMS and DVP shall be removed? 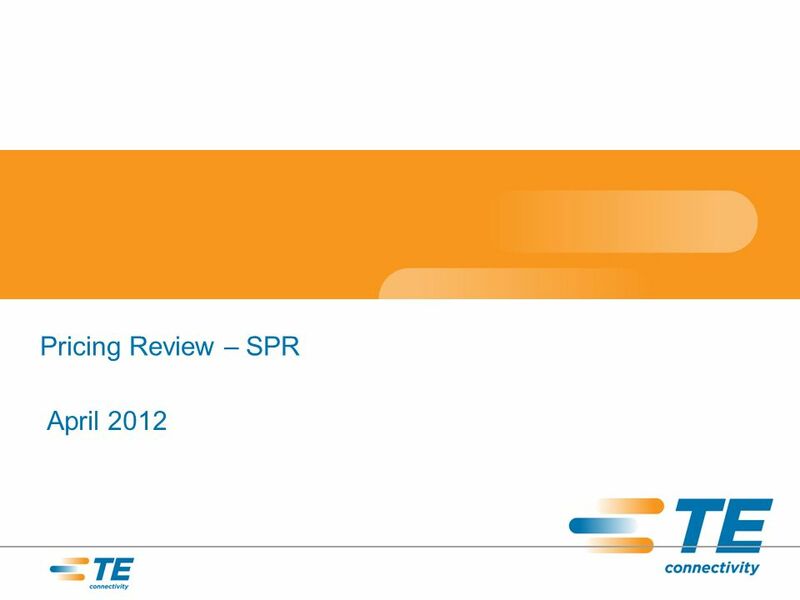 Download ppt "Pricing Review – SPR April 2012. Channel SPR Request Performance." "Turning Innovation into Ingenuity & Profits" Pat Adamson May 12, 2008 CCQH Leadership Club Webinar. INTRODUCING THE NEW NDR + On-Line Meeting and Conference Call Access Code # Deb Salinger – Training material available. 1 FX QUIZ PREPARED BY R N HIRVE CHIEF MANAGER CENTRAL BANK OF INDIA MUMBAI. Stock Market Game Mrs. Heinze. Empowering healthier lives Vitaco Health (NZ) Ltd.
R : RPS Procurement Reform Commissioner Mark Ferron Paul Douglas Jason Simon Lewis Bichkoff January 22, 2013. 2.01C - Explain company selling policies. UMS Submission of PEAR using eTransfer Overview User Security Submit Electronic Transfer Viewing Status of Fund Change Fund Change Reject and Resubmit. 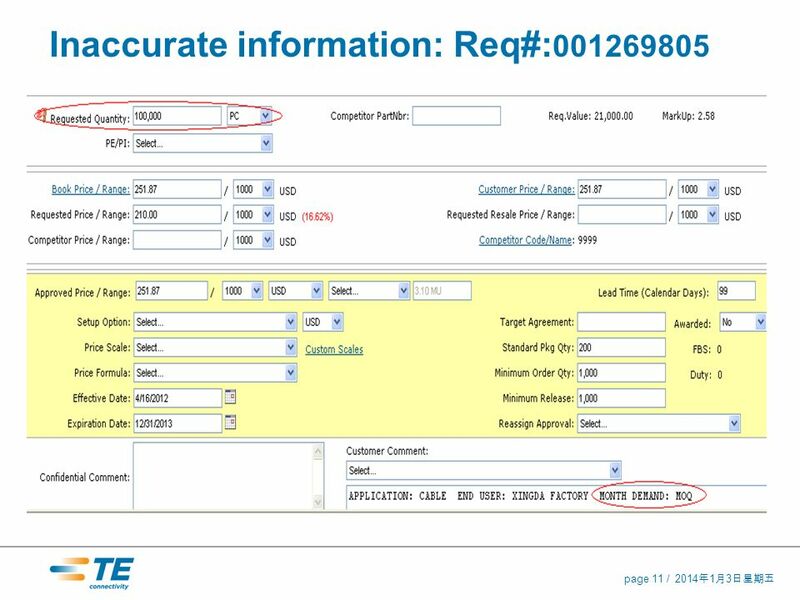 C HAPTER 9 PRICING: Understanding and Capturing Customer Value CRS Questions & Answers. 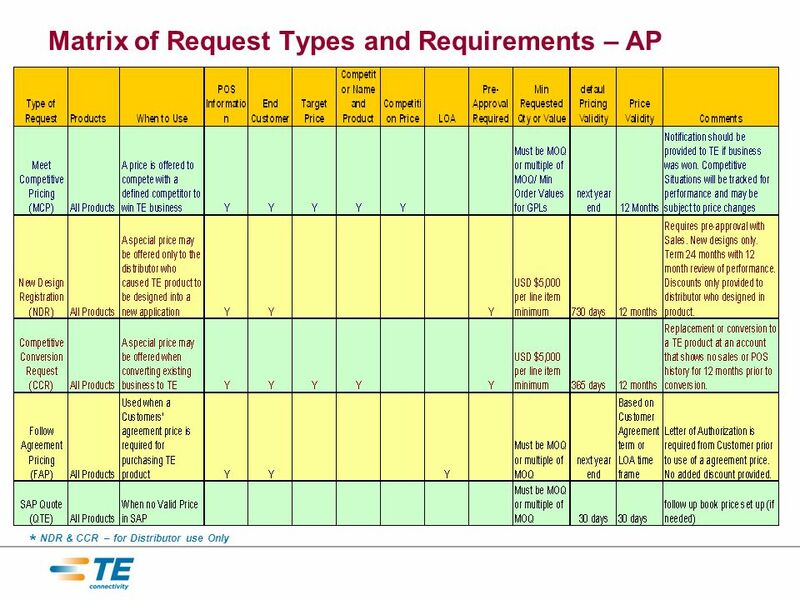 © 2009 Cisco Systems, Inc. All rights reserved.Course acronym vx.x—#-1 IronPort and ScanSafe Partner Integration in Europe Cisco Commerce Workspace.